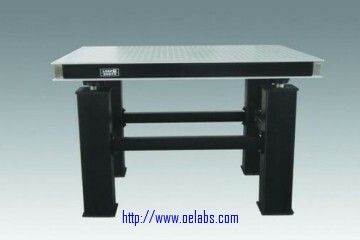 The OET18-12 active optical table made by OElabs features a set of four active isolators and the Optical platform consist of the panel (δ6mm stainless steel (1Cr17)), backplate (δ8mmQ235A steel) and internal strengthening ribs (δ10mm, δ8mm δ6mm Q235A steel). The tabletop features with great working surfaces(Magnetic Stainless Steel1Cr17 material，with polishing and density texture processing),one with Honeycomb breadboard for conducting lab application . Featuring internal anti-distortion diagonal bar board.Good stiffness and strength to ensure the platform with good stability when stationary work. This completed work station system is an ideal solution for experiments with qualified experimental environment and small vertical displacement shift in a typical lab environment. Compound-material solid damping is adopted for vibration isolation.